Kiyomi Lim's Site. 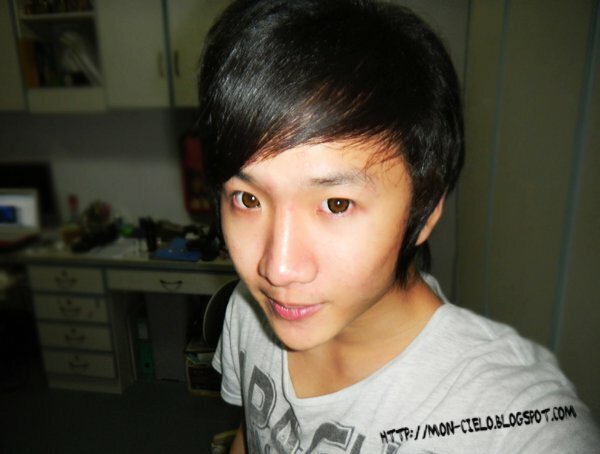 : Contact Lenses Yo~ ! I'm wearing Super Barbie Sweet Brown. Dolly Wink 02 & 05 Eyelash. Used Melliesh Eyeshadow Liner and Dolly Wink Liquid Liner. I am blogging about contact lenses today. Maybe because I got new lenses! YIPEEE! My new lenses are freaking chio(pretty) can?! AND ZOMG, their new packaging for their contact lenses are LEOPARD PRINTS! *hail leopard prints, hail leopard prints... LOL, kidding!!! Super Barbie SWEET series GREY ! ^^ Yay ! *I have worn the sweet pink and brown before! All uber nice! So not I've gotten GREY! Super Barbie FLOWER series BROWN ! Yipee ! *Bought this to wear COUPLE LENS! with my boyfriend cause he've got the FLOWER BROWN too! Super Barbie LACE series Grey !!!!!!!!! *I saw this design and I fell in love with it! So special! See see the model wear!!! Yikes! So pretty! HAHAHAH, my 3 new pairs of lenses ! They used Tsubasa's Bambi as Picture then in the end the pictures LIED. I am right ! It's so different ! then you can buy Super Barbie Bambi also !! It looks EXACTLY(with a thicker rim only because it's 16mm) like the original ! *So if it's being mailed here, like, if you're joining some spree or what so ever, please do not keep high hopes yah? I TRAVELLED to Malaysia to ORDER and got these lenses back through the Aeroplane ! Can you get for me a black super barbie contact lenses, any one will do as long as it is nice to you and its black!!! hello! what is the email to ask u to get the lenses for us? thanks~!